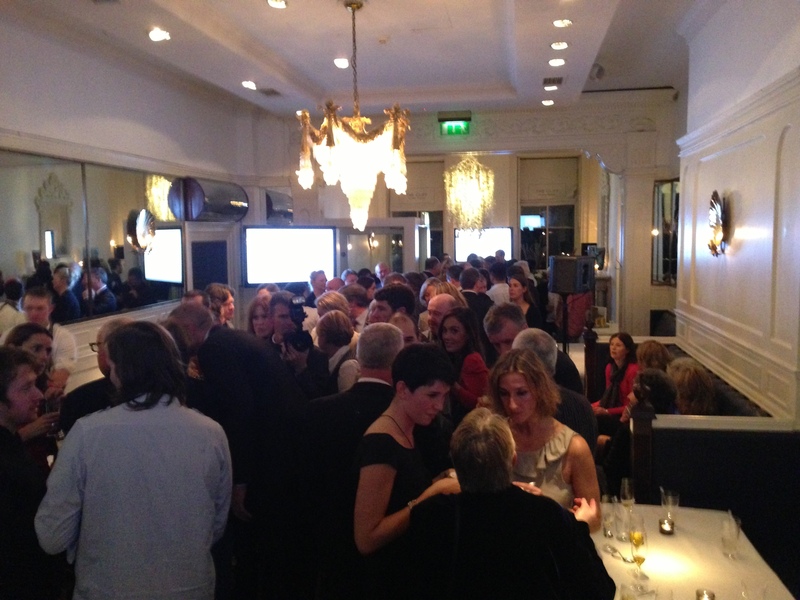 On Wednesday night we had the launch of Let’s Go Disco, with a party at the Cliff Townhouse on St Stephen’s Green in Dublin. Excuse me in advance, but there will quite a few superlatives in this blog post – I don’t see a way around them, and if you can’t express pride at a book launch for a book your very proud of, then when can you? So the book launches this week on Wednesday. It’s very strange to think of people outside the project reading it – I know that sounds strange but it seems like a very personal project between Shane, Martijn and I – obviously the whole point is that lots of people get to read it though so off it goes into the wild. Here are some details from the press release that’s gone out. Design by Red and Grey, Dublin. Here’s a nice piece of stop motion video that Shane produced during some of the photo shoots. He’s had it edited together with some nice music written specially for the exercise. Enjoy. Let’s Go Disco – Behind the Scenes from Aspect Photography on Aspect Photography. And this is it – the first sighting of the book. 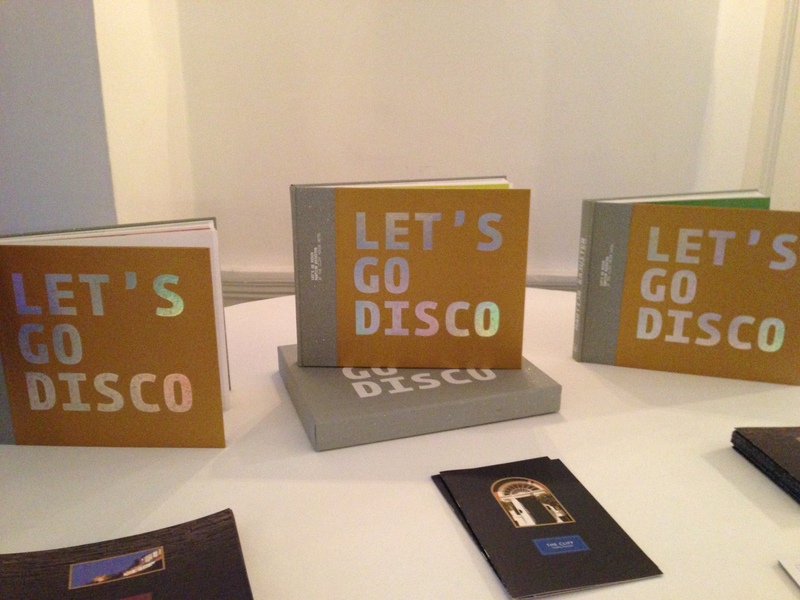 This image is the cover of the special edition version of Let’sGo Disco. It’s wrapped in gold linen and the front is encased in laser-etched brushed stainless steel. Why stainless steel? 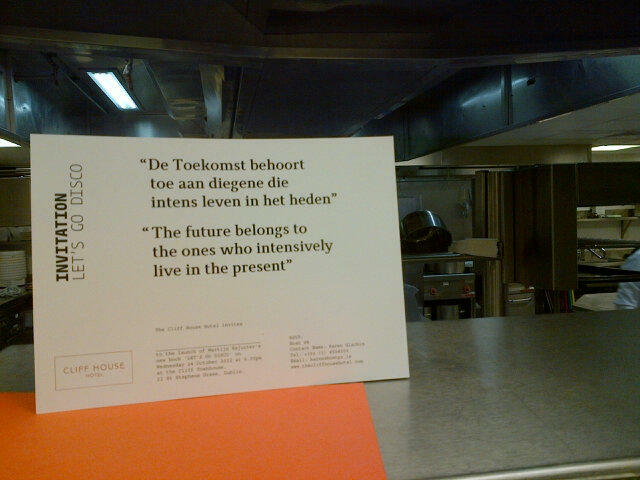 Well, in every fine dining restaurant there is always a contrast between the luxurious interior of the restaurant and the fluorescent-lit industrial kitchen, so this cover is a way of bringing these two aesthetics together. Overall the collectors edition is a really lush thing – it comes in a box with some other bits and bobs – I won’t say exactly what until it’s launched in order to maintain some mystery for those who were lucky enough to pre-order one – but overall it’s a thing of beauty. We’ve put our heads together on this and don’t think anyone has ever used this treatment for a book before. We could be wrong of course, but as Martijn has a cookbook collection of over 1700 volumes and he’s never come across it, it’s probably unique. For anyone who hasn’t already pre-ordered the special edition, sadly it’s completely sold out. Only 100 were made and they were all spoken for within 48 hours of being casually mentioned by Martijn on twitter. For those who didn’t manage to get one – don’t worry, the main edition of the book is still a very, very nice thing with production values well above those typically found even in high-end food books. More info to come. 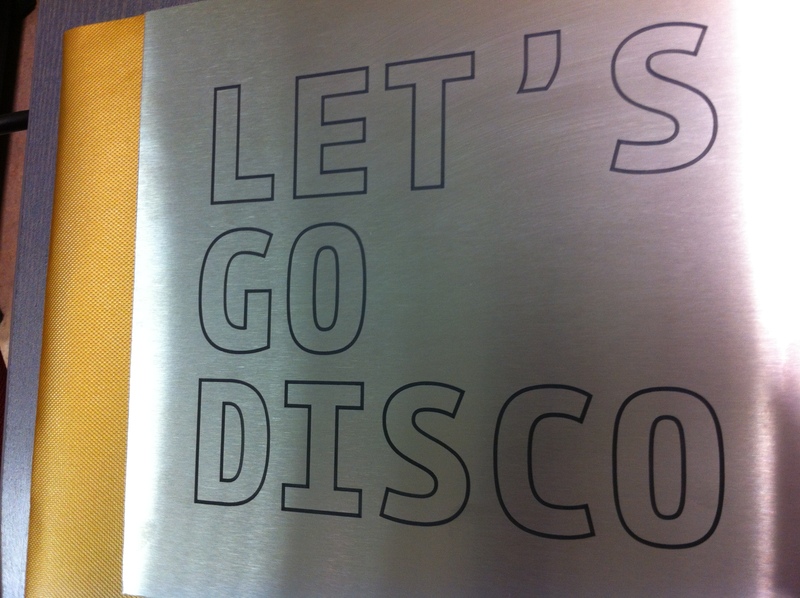 And as the invites for the launch night have gone out, it’s probably okay now to mention the title: Let’s Go Disco. Martijn tweeted this earlier today, so the cat’s out of the bag. And really, what else could we call it? The book has gone to the printers. Over a year after myself, Shane O’Neill and Martijn Kajuiter first started discussions, the big red button marked ‘print’ has been pushed. The process so far has been really interesting – effectively this has been a privately published book – because we did it ourselves we had the ultimate level of control over the book, it’s look and contents. Opting to print the book with a publisher would have meant making compromises on how it was made in order to make it more commercially attractive. Ironically, I think it’s ended up as an extremely desirable object that may be more commercially succesful than it otherwise might have been – I wouldn’t be surprised if it sells out of its initial print run faster than is expected. High on the list of things we didn’t want to do was to water down the recipes featured in the book in order to make them achievable in a domestic kitchen. 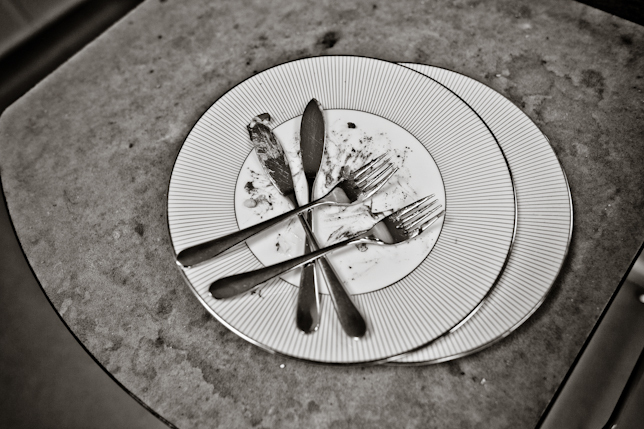 The central point of this book – that it should document a particular period of time in the life of a restaurant – wouldn’t have worked if we’d changed the food. What would be the point? The end result is that the book features the actual recipes used in The House restaurant. 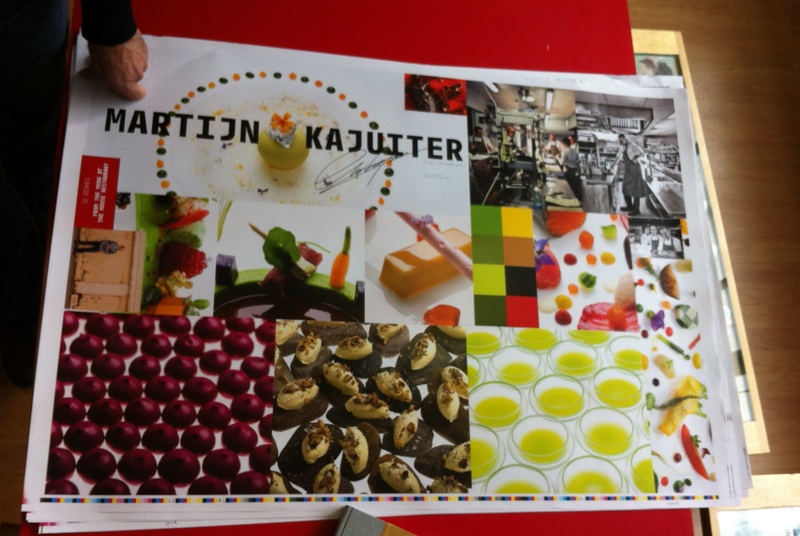 This is actually quite unusual – most high end chefs don’t want other chefs to be able to copy them so they don’t publish their working recipes but Martijn decided to give his away. In his mind, it doesn’t matter if someone tries to copy them, because by the time they do that his cooking will already have moved on and he will be doing something else. The book is all about a moment in time, and the recipes in it are evolving and changing all the time. I think it’s a really healthy approach. So right now, the presses are rolling. Exciting stuff. The book has been brought to life with some really high production values – from the outset, we wanted to make sure that it was a quality production so a great deal of care and attention has gone into it. The picture above is of the ‘wet proofs’ of the book – this is a large sheet of the actual paper the book will be printed on – or in our case of the two different kinds of paper. On this, the printer has compiled a series of images taken at random from the book, designed to give an accurate idea of exactly how the artwork from the book will eventually look. This is actually the second set of proofs that we’ve been through – prior to this we were sent the lithographer’s proofs, which showed the work that had been done to prepare the book’s photography for printing. Most mass market books don’t really go through this stage, which explains why there are often problems with colour reproduction. The food photography in most recipe books is produced in a relatively short period of time, allowing the photographer to standardise their pictures, to make them look as much as possible exactly the same. Obviously the dishes are different, but the kind of lighting used, the backgrounds, that kind of thing should be uniform. Because Shane O’Neill took the book’s pictures over an eleven month period, there was an unavoidable degree of variation in our backgrounds. The lithographer’s job was to colour correct each image to make them sit more comfortably side by side. At the same time, they also had to ensure that the colours captured by Shane’s camera were accurately reproduced in the finished book. If you’ve ever wondered why lemons sometimes look a bit like limes in some food photographs, it’s usually because this step has been skipped. Computers and high-end printing presses reproduce colours in completely different ways – your PC monitor displays Red, Green and Blue pixels while printing presses use the CYMK colour range – Cyan, Yellow, Magenta and Key (Black). The wet proofs show what the digital image files will look like printed in CYMK colour using the actual plates that the book will be made from. I’ve been working on a book project for the last year or so with Dutch-born chef Martijn Kajuiter of the Cliff House Hotel in Ardmore, County Waterford. Martijn is an exceptional chef, and his restaurant is one of the most innovative and significant in the country – it was awarded a Michelin star in 2009 and has kept it in successive years, as well as being awarded three AA Rosettes. His food is exciting and progressive as well as being firmly rooted in a very well established repoirtoire of classic methodology. While not exactly a secret, we haven’t discussed the book publicly over the last year, because the immediate nature of social media would have meant the world was bored stupid by the idea of it, months before it came out. Instead we decided to keep quiet until it made sense to not keep quiet about it. I still don’t want to say too much about it yet, because The Cliff House is preparing to launch the book and so it’s up to them to publicise it and release images and extracts to the public. However, now that the publication date is drawing near it’s nice to be able to start to acknowledge the book’s existence. But of the normal version, what can I say? Well. the first and most significant thing is the price – €45. The book is being self published and we’re quite proud to have been able to keep the cost relatively low, given the amount of work and the quality of the finish that’s gone into it. It might not seem low to someone used to buying mass-market food books, but it’s really not expensive for a book like this. It’s not uncommon for self published books of this kind to sell for €100 or €200 and it’s not hard to see why once you start making them. In our case, there have been multiple photo shoots, spread out over the course of a year in order to shoot dishes in season and at their best. The photography has been presented on high quality paper in a hard back book wrapped in a truly gorgeous cover. The design work has been created from scratch by an excellent design agency and enormous attention to detail has gone into each detail of how the book has been created. Literally every aspect of it has been thought about, considered, explored and decided upon. The book is currently scheduled to be available in the third week of October. I’ll post more information here as it’s appropriate, along with links to where you can buy the book and perhaps also some of the unused photography and behind-the-scenes material generated during the year we spent working on the project.